How to Move Photos from iPhone to iCloud Storage Easily? Many people are not aware of iCloud and how it works exactly. If you are in that category, this article is an effort to bring it to the fore. iCloud is Apple’s effort in giving you the opportunity to manage your files better. Remember your iPhone, iPad or other devices do not come with unlimited storage capacity. This means that at some point, there are chances that you may start running out of storage, which will make your device become sluggish and slow. One of the best ways to manage this situation better is by moving photos to iCloud, then deleting all these photo from your iDevice to get back free storage. Moving photos to iCloud from your iOS devices is not a difficult task. It requires just a few steps and once done, you can view your photos without stress. The following is a step by step guide, just follow it. Step 1: Sign into your iCloud.com account. If you do not have one, create one yourself. Step 2: Go to “Settings” on your device and select the “iCloud” option. Step 3: Turn on “Back up to iCloud” from the window that opens after selecting iCloud option. Then select” Back up now” to move photos to iCloud. Given the large amount of photos that we have today, our phone’s memory soon gets filled before you know it. Therefore, a good solution is to delete the photos that you do not want and perhaps export them to PC for safekeeping. If you have already moved the photos to iCloud, the next step is to managing these photos on iDevice so as to conserve space and help your device perform in a better way. Thanks to iMyFone Umate Pro or iMyFone Umate Pro for Mac, you now have one of the best tools for managing your photos on iPhone/iPad/iPod Touch. iMyFone Umate Pro is actually simple and easy to use, it receives lots of positive reviews from macworld.co.uk, Makeuseof.com , Cultofmac.com etc. 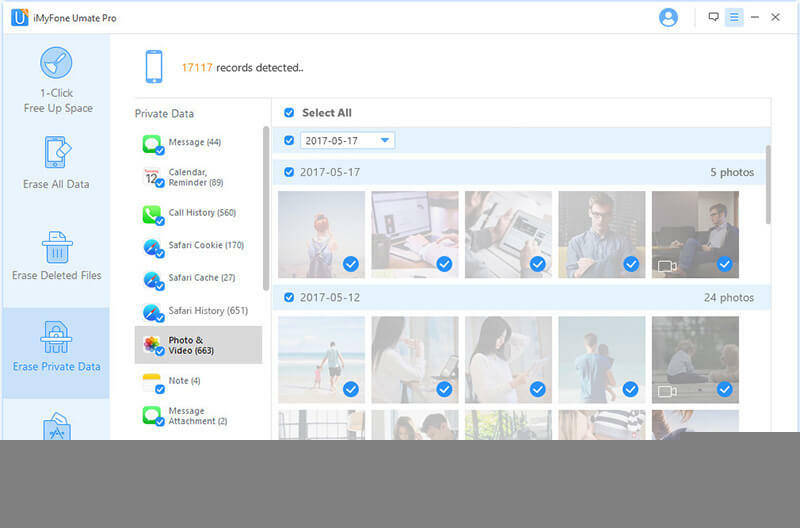 With iMyFone Umate you can clear up photo caches, compress photos to reclaim 75% of your photo space, mass delete photos to free up space and export photos to PC as your backup. 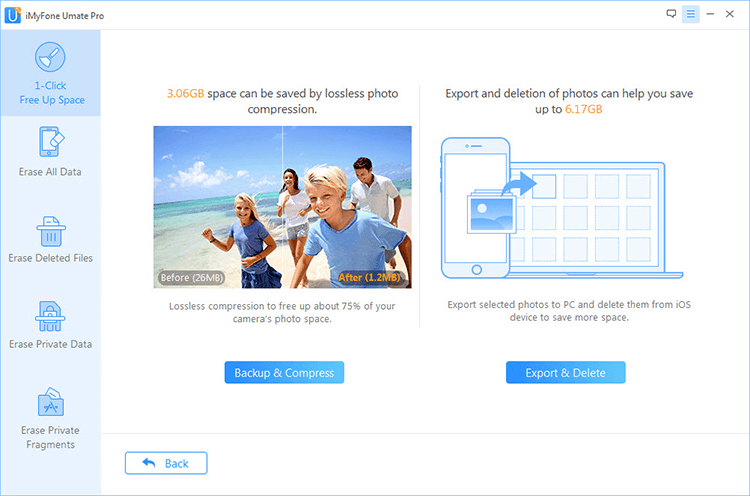 What's more, all your original photos will be backed up on your PC, so you can even skip the step of removing photos to iCloud, as you will have a backup on PC. Step 1: Run the program on your PC or Mac, then connect Your iOS device to it. Step 2: Choose the "Photos" option from "1-Click Free Up Sapce" tab, and scan your iOS device. Step 3: Click on the "Backup & Compress" button or "Backup & Delete" button to free huge space for your iPhone. 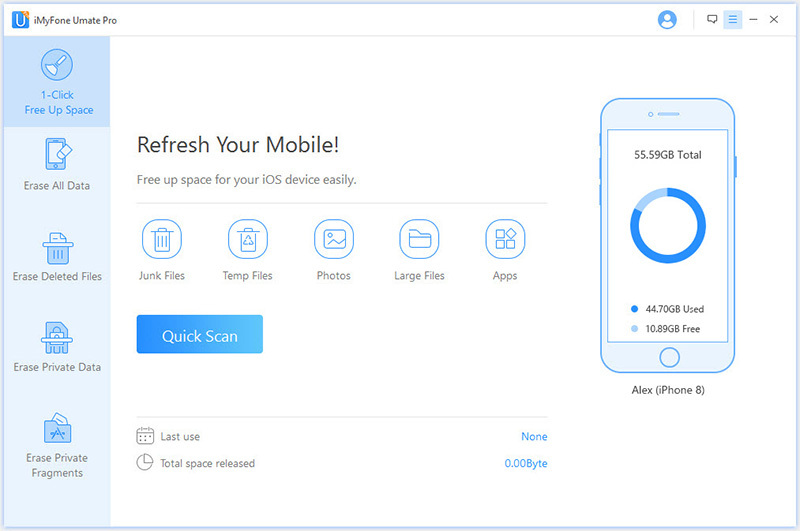 To clear up photo caches on iPhone or iPad, you should go to the function of clear up "Junk Files", this will clear up all app caches, cookies and crash logs on your device. The good thing is that you can even do this with the free trial version, you won't need to pay for it! Kindly note, managing photos from "1-Click Free Up Space" just simply delete the current photos from your device. Photos deleted by that can be recovered. If your photos are something about your personal life, you can consider the erase features of iMyFone Umate Pro to completely destroy your photos, 100% unrecoverable. To do so, 2 erase modes are recommended to you. Erase Private Data: With advance overwriting technologies, it can completely overwrite the selected original photos from your device without leaving any chance of recovery. Erase Deleted Files: iMyFone Umate Pro applies 25+ analysis technologies and photos simply deleted from your device or via "1-Click Free Up Space" can be found out. Once you run this mode, even the best recovery tool cannot scan out the erased photos. you will not worry about the privacy leak of your photos. iCloud is a useful tool from Apple. 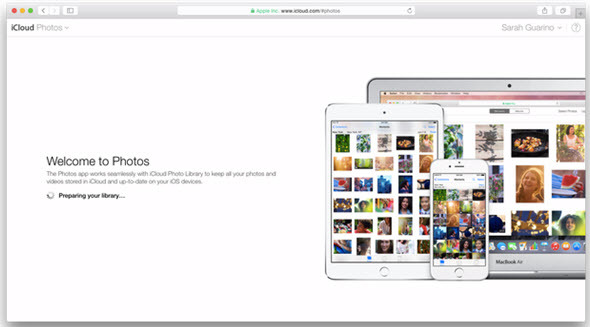 First, it allows you to save videos, photos, music, documents and app data to iCloud. Secondly, it does not just allow you to store all these in a place but will also allow you to access every of your files as well as data from any of your iOS devices keeping them up to date across all of them. It doesn’t even end there; iCloud will let you create new folders and files from any iCloud enabled apps allowing the access across multiple apps. When you set up your iCloud, it automatically backing up your files including ones you may not care about. Before moving photos to iCloud, it is best to always optimize your iCloud storage in order to save your storage allowance. The following are steps to optimize your iCloud storage. Step 1: Go to “Settings” and choose “iCloud”, and tap “Storage and Backup”. Step 2: Choose “Manage Storage”, then choose you device. Step 3: Click “Show all” to see all storage using apps, then select apps which have items you will like to backup. Step 4: Click “Turn off and Delete” apps you do not want to backup. Where Do Deleted Photos Go on iPhone? Do Deleted Photos Stay on iCloud? Tata Davis knows almost everything you need to know about iPhone/iPad/iPod, especially the privacy protection on iOS.